Today another SA contributor, Mark Hibben, published a really interesting method for backing into Apple’s (NASDAQ:AAPL) total iPhone sales for the December 2017 quarter. His method involves looking at the projected product mix numbers recently published by the Consumer Intelligence Research Partners, LLC (CIRP). Please read Mark’s insightful article for his original analysis, but I will sum it up quickly here. CIRP is a Chicago-based analytics company that conducts consumer surveys in the United States as basis for their findings. 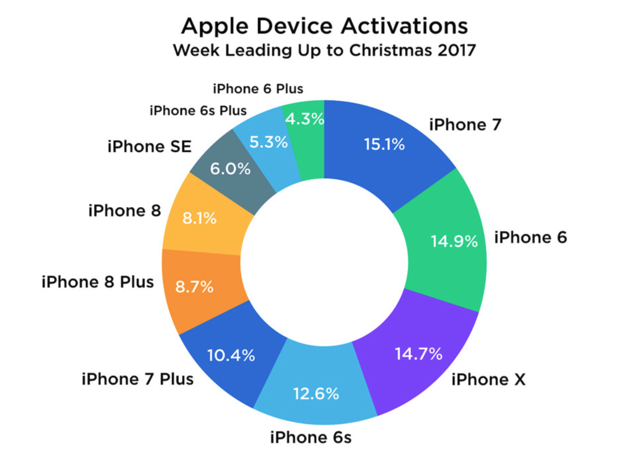 To compile their data, they have conducted a survey of 500 U.S. Apple customers who purchased an iPhone, iPad, or a Mac in the US in the October to December 2017 period. Here is the product mix that CIRP suggests for the US customers of the iPhone brand. From the report, CIRP finds that the new iPhones 8/8 Plus, and X account for 61% of total US iPhone sales in the quarter, with iPhone 8 models accounting for 41%, and iPhone X for 20% of sales. This gives us a good idea of the potential product mix for the different iPhone models, but what about the magnitude of the actual sales? Canalys, an analytics company, has recently come out with one of the more conservative prognostications for the total iPhone X sales for the December 2017 quarter, at 29 million worldwide units. Many people looked at this number as a disappointment considering that many have expected a 40 million plus super cycle. But let’s take the 29 million units projection at its face value and see how much that would mean in total iPhone sales. Remember Apple is no longer a one phone per year, or even a two phone per year, company. Currently, Apple has a total of eight different models for sale, all commanding premium pricing. If we assume that Apple has sold 29 million units of iPhone X and that represents 20% of all iPhones sold that would mean that Apple has sold a total of 145 million iPhones in the last quarter! How is that for a super cycle? Okay, but I know what your criticism is going to be. The report above is based on a survey of only 500 U.S.-based customers. Can that really be representative of the rest of the world? How accurate is it in general? Well, let’s look at data compiled by Flurry Analytics. Flurry Analytics is an analytics company that allows app developers to install Analytics code into their apps and collect all kinds of customer data, including the make and model of the phone, engagement time, etc. Similar to Google Analytics for the Web. Flurry is used by over 1 million mobile apps and has insight into 2.1 billion devices worldwide. So their data should be pretty reliable. 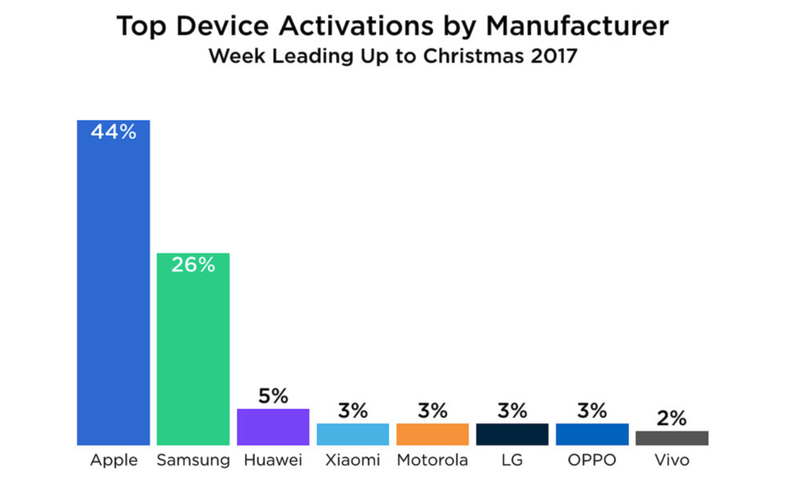 Flurry published a report based on the data they’ve acquired during the week leading to Christmas 2017. Here’s new phone activations broken down by percentages for the top 10 most popular iPhone models activated during that time period. The above product mix projections are based on data collected worldwide and should be representative of the total worldwide product mix. Based on the data above, if we assume that Canalys is right about their 29 million iPhone X estimate, that would mean that Apple has sold 197 million iPhones during the last quarter (Q1 2018)! That would be a super cycle indeed! 197 million units is probably a stretch, and we will find out the real numbers next Thursday. However, these calculations also mean that even if iPhone X prognostications by companies such as Canalys are off by as much as 50% and in fact, iPhone X has performed “abysmally” and only shifted 15 million units, that would still leave Apple with over 102 million total iPhones sold in the last quarter. Given that in 2016 Apple moved 78 million iPhones in the same quarter, we are looking at at least a 30% YoY unit shipment growth. Combine that with greater profits from the X line, still industry-leading profits from the older 6, 6S, SE, and 7 lines, for which the tooling and R&D has already been long since paid for, and we end up with a potential for a very profitable quarter indeed. Another interesting insight from the Flurry report is the device activations by brand in the week leading up to Christmas 2017. As you can see Apple has dominated the Christmas season, with Samsung (OTC:SSNLF) trailing behind. This is an important takeaway to remember. Apple is no longer a one device company. They now have a wide selection of phones targeting almost every demographic (except perhaps the very low end of the market). They are also a leading laptop manufacturer, sell a ton of headphones and other accessories and have an aggressively growing services market. And that doesn’t even include their recent aggressive push into the self-driving automotive space and their upcoming home speaker business. At the time of publication, AAPL is trading for around $171 being pushed down by a flurry of bearish reports, which are all too common right before the Apple earnings announcement. Many analysts have cited the 29 million iPhone X units as the reason why AAPL is going to do horribly this quarter. But above, we’ve seen that 29 million iPhone Xs, given the projected product mix, would mean simply amazing sales for Apple. If you are already long Apple, this is a good position to hold. And if you are looking to initiate a position, recent weakness due to earnings anxiety may offer a good entry point. Our personal conservative price target for the end of 2018 is $205.